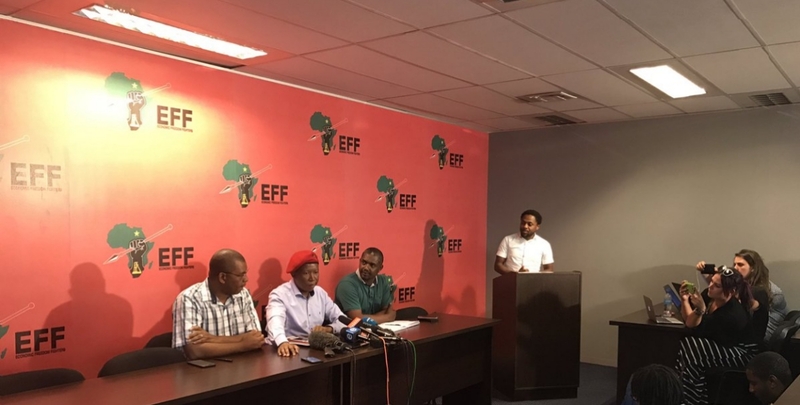 At the Economic Freedom Fightersâ€™ (EFF) press conference on Friday, Commander in Chief Julius Malema rejected Jacob zumaâ€™s midnight cabinet reshuffle. Malema spoke emphatically on a range of issues and called what was taking place a national crisis. â€œIt is done, the country is captured. Treasury is now in the hands of the Guptas,â€ said Malema. Malema argued that the ministers fired were disposed of because they had very little political support – no constituency – within the ANC and were thus easily replaceable in favour of individuals who supporters of President Zuma – particularly those who would support the President within parliament and at the next ANC National Executive Council meeting. Malema said that the decision not to fire Blade Nzimande was due to the pressure placed on Zuma by the South African Communist Party, which Zuma strategically needs the support of, given the strength of their constituency. Yet despite the factionalism within the ANC, Malema said that it was a welcome surprise that deputy president Cyril Ramaphosa spoke out against Zuma today. Contrary to sentiments on social media, Malema felt that Ramaphosa should not resign as he served a better purpose against Zuma within Parliament. Malema outlined that the next course of action for the EFF was the vote of no confidence to remove Zuma as president of South Africa. For this to be successful, he said that of the 400 members of parliament, 201 would have to vote in favour of the removal of Jacob Zuma. Given the makeup of parliament, this would mean that 70 members of the ANC would have to vote against the president. Malema said that if ANC members had the good of the country in mind, they would fight for the removal of Zuma as he continued to lead the country down a path towards devastation. Failing the vote of no confidence, Malema said that there was still the upcoming Constitutional Court hearing pushing for the impeachment of President Zuma based on the findings of the Public Protectorâ€™s Nkandla report. He said that detractors saying that the ConCourt could not remove the president needed to read the EFF papers to understand the strength and legitimacy of their case. The overall message Julius Malema imparted was that now was a time for citizens of South Africa to take to the streets in protest of the fact that their country is being sold to the highest bidder by corrupt and ruthless thugs. He called for unity of all political players, including civil society, and praised the actions of SaveSA and Zwelinzima Vavi in marching in Pretoria and to Parliament in Cape Town.